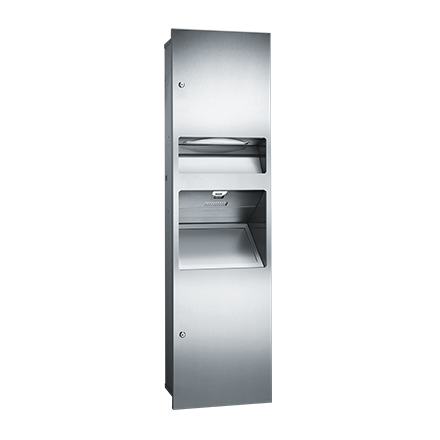 Cabinet only for the Simplicity Collection 3-in-1 – Paper Towel Dispenser, HIGH SPEED Hand Dryer & Waste Receptacle which dispenses 500 standard multi-fold or 400 standard C-fold paper towels and shall have a waste capacity of 6.8 gal (26 L). Durable 20 gauge stainless steel cover has a satin finish. Cabinet only – no hand dryer included.